Mockingbird, like a lot of long-running comic characters, has a really weird history. She started as a love interest for Ka-Zar before Shanna the She-Devil was introduced. She was a brunette psychic in her first appearance, dropped the psychic powers the next issue, and was blonde the month after that. Her first origin was that she and her fiance were biologists working with Ted Sallis, but then her fiance was working for AIM and she was secretly a SHIELD agent spying on him. She finally got a supranym in 1976, but not "Mockingbird": her original name was Huntress, which would have been fine if the character hadn't then disappeared for four years, allowing DC to introduce its own Huntress in 1977. She became Mockingbird in Marvel Team-Up #95, but seemingly died at the end of the issue (it didn't take). Mockingbird is wearing her modern costume, the one she got after coming back to life during Secret Invasion. That is a wise choice, because her classic costume was kind of stupid - it was basically a swimsuit with big floofy sleeves. I think they were supposed to look like wings, maybe? Eh, it was the '80s. This costume, meanwhile, looks like something an agent of SHIELD might actually wear: sure, the cleavage is awfully low (because comics), but the suit itself appears to be that cross between leather and spandex that costumes are made out ouf these days. The "made to be adapted to live-action" design sensibility. It's a new sculpt, with five large black buttons down one side, and armor on the forearms and shins. It's going to be interesting to see who they repaint this into. Her head is new as well. She does have a bit of the "wide eye" thing going on, thanks to variances in the paint job, but you might not be seeing that too often, since she also comes with removable glasses. Yes, in an effort to mimic her old mask, her new costume includes yellow-lensed glasses with a white frame. They slip into notches in her hair, and stay on well. 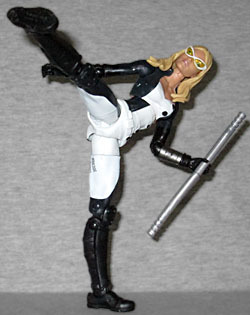 Since her first appearance (as Mockingbird), Bobbi's weapon of choice has been a pair of escrima sticks... sorry, "battle staves" that can lock together to make a single longer staff. So naturally, she gets the same accessories that Daredevil carried. They're made from a nice, stiff plastic, and can plug together to form one bigger beating stick. Her hands are molded to hold the staves, and she has all the articulation necessary to use them: ankles, knees, thighs, hips, torso, wrists, elbows, shoulders, neck and head. It'd be nice if her wrists hinged the other direction, so she could point the sticks, but that's a minor quibble. It's worse that her hair gets in the way of the head moving around. Despite being about 80% new molds, Mockingbird comes with the lion's share of the Red Onslaught Build-A-Figure: the entire torso, plus two big pieces of armor for the shoulders. So many pieces! Though she'd been around for years, Mockingbird didn't really come into her own until they decided to make her the Black Canary to Hakweye's Green Arrow. She was brought back to life after Secret Invasion with the pitch that she and Clint would be "the Mr. and Mrs. Smith of the Marvel Universe," but nothing really came of that. However, she's a great member of the Avengers, and she's a great action figure.